How Do I Repair Floor Fans? Attics can reach more than 150 degrees Fahrenheit in the summer. However, most people who store stuff in their attics do not realize the damage that this kind of heat does to their belongings or can do to their health. 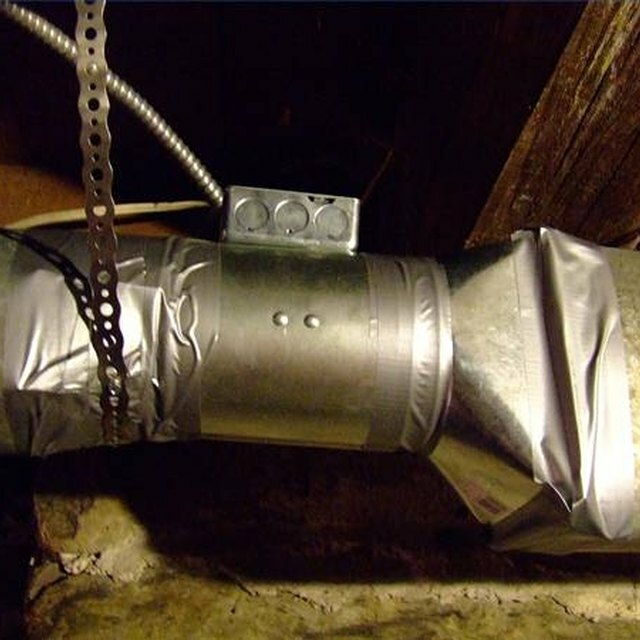 To protect belongings in your attic, install an exhaust fan to help get rid of some of the heat. The Masterflow PR2D is a power roof ventilator exhaust fan that is recommended by Good Housekeeping. With installation of the unit, you can earn the Green Energy Tax Credit. Installing the Masterflow Pr2d is a power roof ventilator exhaust fan keeps your attic storage cool and cuts overall housing cooling costs. Decide where you are going to draw power from. Typically, you can get power from the attic's light installation. Remove your old attic fan or vent. It is usually screwed or nailed in depending on how old it is. Center your louvered cover over the vent hole and trace around it. Measure 5/8-inch in from each side of the tracing and redraw the slightly smaller rectangle. Use a saw to cut out the wood for your cover. Cut along the 5/8-inch markings. Screw the cover into place, then seal it with the acrylic caulk. Cut two pieces of 2x4 to fit tightly in-between the studs on either side of the cover. Nail them in place with one above the frame and one below. Measure the plywood to cover the frame created by the attic studs and two new 2x4s. Cut accordingly and nail into place. Trace the fan template on the plywood, then cut out the hole for the fan. Center the fan and screw the fan's housing to the plywood. Make sure that the top side of the fan is facing up, and the bottom down. The housing should say which is which. Spin the blades to make sure they do not hit anything. Remove the cover and controller on the thermostat, and fasten it to an open corner of the frame. Most thermostats come in a metal box that can be used to mount it to the plywood. Connect the metal sheath-covered wires from the fan to the thermostat with the electrical conduit. Turn off the light to the attic, but make sure you have a secondary source of light before doing so. Make sure the attic light is on "off" and then remove the light bulbs from the light fixture. Use a Romex connector from the junction box to your lighting outlet. Run the Romex wiring from the light fixture to the exhaust fan, but do not worry about wiring yet. Remove ¾-inch of a strip of insulation from the thermostat. Connect all white wires with a nut. Wrap the ground wire around the green grounding screw inside the box. Run the black wires from the lighting fixture to the black wires on the thermostat, but run the red wire from the thermostat to the black wire coming from the motor for the fan. After you have done this, set the thermostat for 95 degrees. Cut 6 inches of red, white, black, and grounding wire from your romex spool. Just like at the thermostat, connect the white wires with a wire nut. Copy this process with the black and ground wires. Make sure that all wiring has is wrapped with electrical tape. Turn on the power to test your new set-up. Jason Gabriel is a technical writer with a graduate degree from the University of Alabama. His work has been recognized and published by universities, businesses and the government. Gabriel was the winner of the Arizona Statehood Writing Contest.